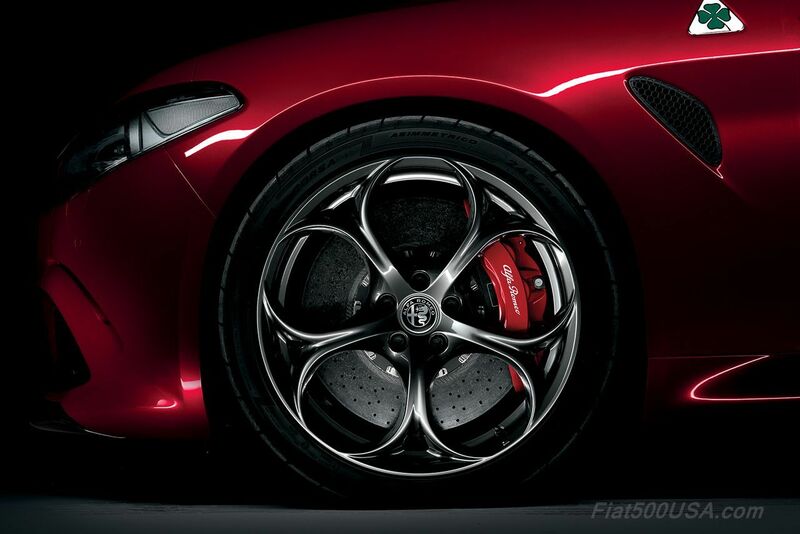 Interior shots of the new Alfa Romeo Giulia Quadrifoglio that made its North American debut at the 2015 LA Auto Show. 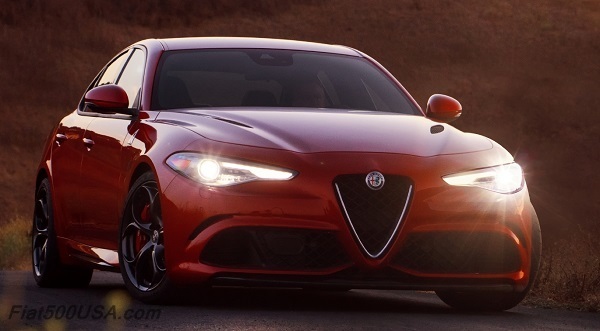 The Alfa Romeo QV was a huge hit at the LA Auto show. 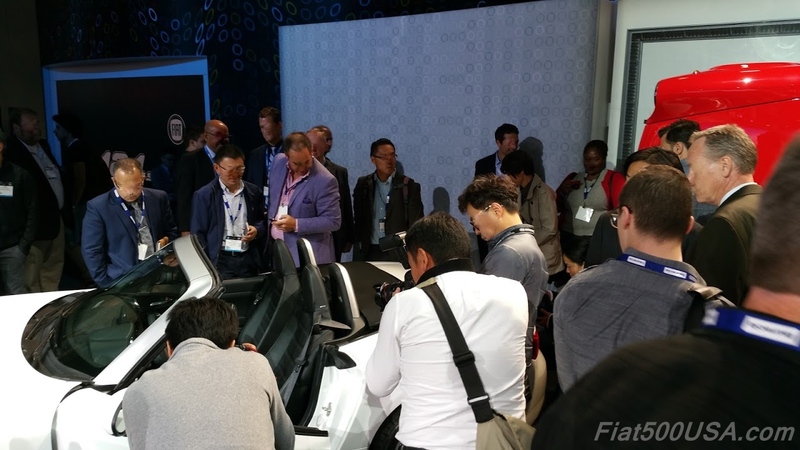 Here is the car right after its press introduction. A look at the Alfa display at the LA Auto Show. At the Alfa Romeo display at the LA Auto Show. Fiat has given enthusiasts the chance to own a very special 2017 Fiat 124 Spider. 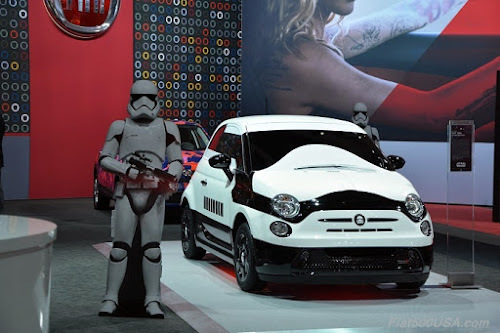 The first production run of 124 vehicles will be offered as an exclusive version called the Prima Edizione Lusso. 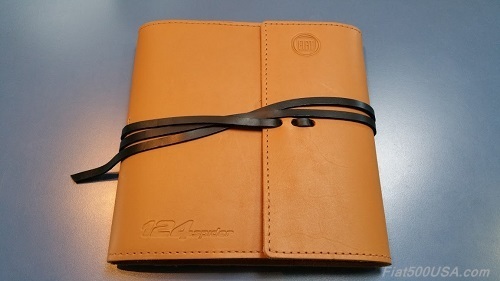 Owners who purchase a Prima Edizione will also receive limited-edition swag, including wearables and a poster. 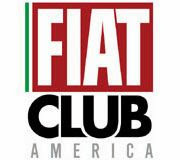 For more information about ordering a Fiat 124 Spider Prima Edizione, interested customers can sign up for updates at the Fiat USA website. Images authors and courtesy of FCA. 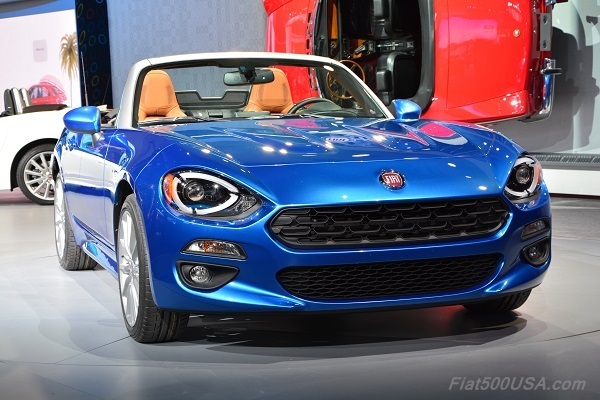 The 2017 Fiat 124 Spider was unveiled at the 2015 LA Auto Show Wednesday, November 18. If you missed it, here is the full event video for your enjoyment. 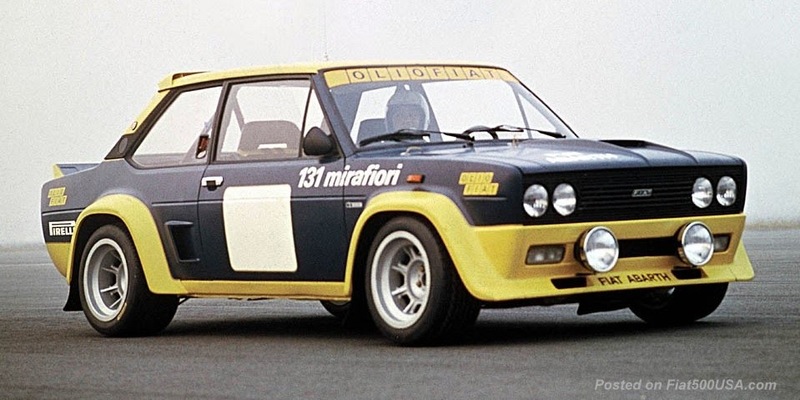 We'll have full details on the Fiat 124 on this site. 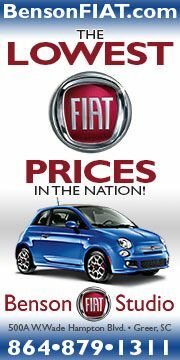 Also keep checking on the Fiat 500 USA Forum and our Facebook page! 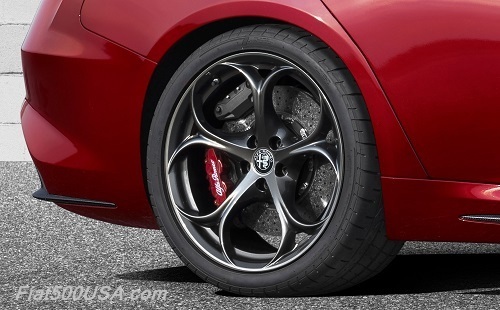 The North American Alfa Romeo Giulia Quadrifoglio was unveiled at the 2015 LA Auto Show Wednesday, November 18th. Alfa Romeo brought a stunning array of cars to celebrate the Giulia's arrival to the North American market and the debut was truly spectacular - just like the car! 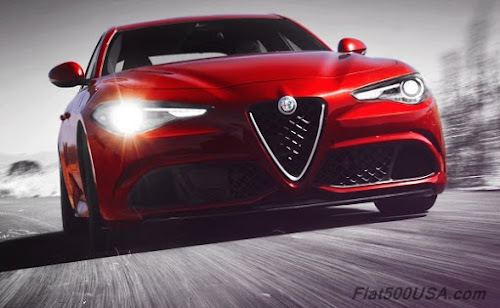 Full details on the Alfa Giulia Quadrifoglio are here on this site, plus the Alfa Romeo Giulia forum, and our Facebook page. *Updated the story with the full launch video for those who missed the event. 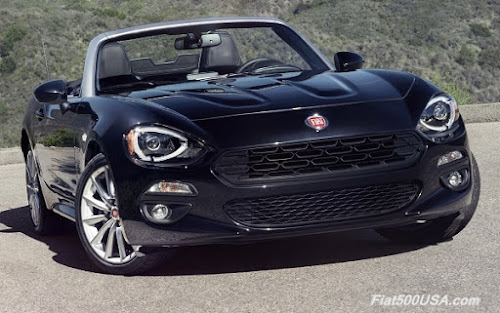 Designed at Centro Stile in Turin, Italy, the all-new Fiat 124 Spider delivers a modern adaptation of a legend. 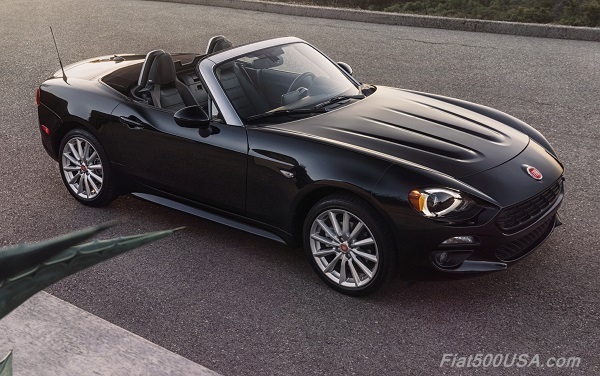 The iconic styling of the 2017 124 Spider features cues from one of Fiat’s most beautiful cars of all time – the original Spider – and translates them for the 21st century. 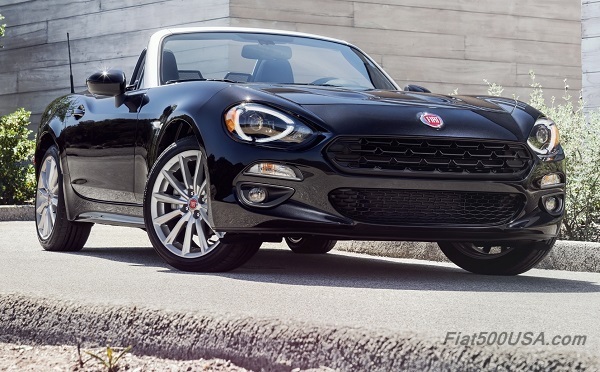 The 2017 Fiat 124 Spider joins the FIAT family of iconic contemporary cars strongly rooted in the brand’s heritage. 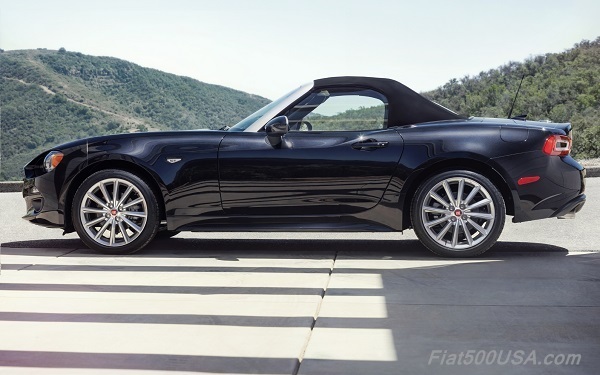 With its timeless low-slung presence, the Fiat 124 Spider features a classically beautiful bodyside with well-balanced proportions and a sporty cabin-to-hood ratio. 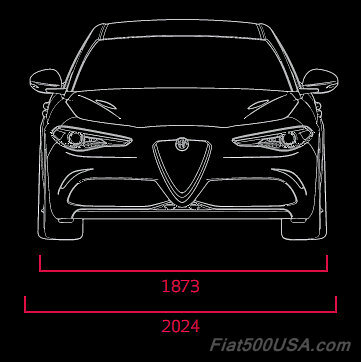 A horizontal line emerges from the front fender, kicks up over the rear fender and flows toward the rear headlamp, an interpretation of the historical 124 Spider’s body. 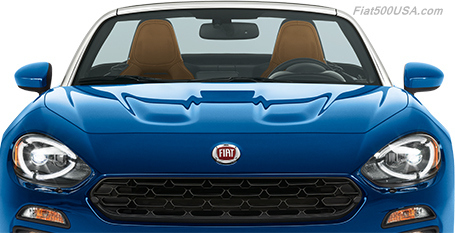 The upper grille has a hexagonal shape, inspired by the unique shape of the original 124 Spider’s front air intake. A hexagonal grille pattern emphasizes this shape and echoes the sporty honeycomb mesh on the grille of the original 124 Spider. Signature LED front and rear headlamps add to the car’s expression both day and night. The front lamps have a focused appearance, and when paired with the hexagonal front grille, give the car an alert expression, while the lower grille has a friendly look and an “eyelid” that wraps over each front headlamp and runs toward the upper corner of the front grille. Front turn indicators and fog lamp bezels add a dynamic touch that, combined with the wide hexagonal grille, give the front face an unmistakable character. “Power domes” on the front hood emphasize the engine’s location and power, and give a nod to the second-series 124 Spider, where the domes were originally introduced. 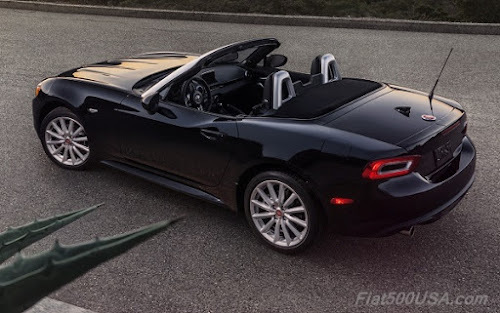 The rear of the Fiat 124 Spider is defined by two main features: the “seagull” section of the rear fenders and sharp horizontal rear lamps – both elements found on the original 124 Spider. The rear fenders are shaped so that the upper surface falls inward toward the decklid, giving them a distinctive V-shape from the rear. 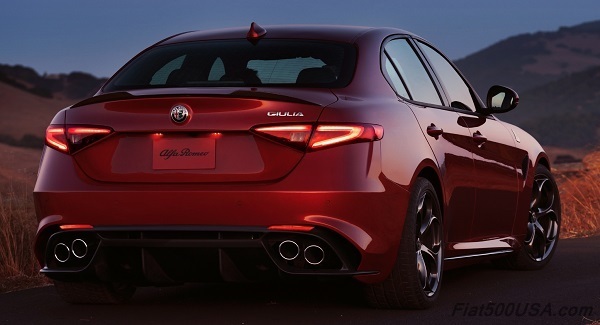 The body color insert in the rear lamps, a signature detail, gives the lamps a closed loop appearance. 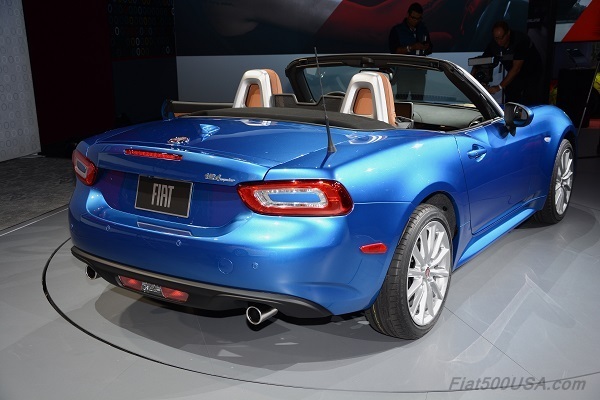 An integrated rear spoiler enhances the aerodynamic performance, and the rear license plate is mounted between the rear lamps, as on the original 124 Spider. Twin exhausts underline the performance capability of the engine. With Italian craftsmanship and premium materials throughout, the interior of the Fiat 124 Spider is designed to focus on its occupants. Ergonomics were applied to ensure the steering wheel, pedals and shifter are easily and quickly operable while driving. 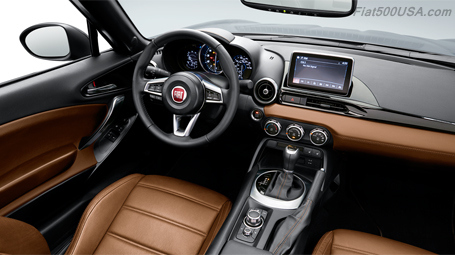 The dashboard features a unique design with a colored bezel, and uses soft-touch materials. 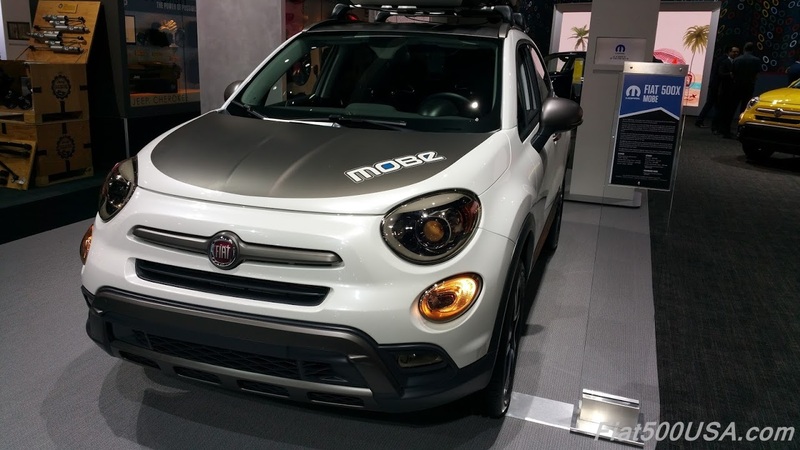 The cluster graphics, round meter hood and wrapped dome call to mind the Fiat 500X, and the horizontal painted bezel comes from the Fiat 500. The steering wheel was ergonomically designed to emphasize the car’s handling, and is crafted with premium grained leather. The seats, which have a light net structure with unique foam shape and upholstery, were also designed using ergonomics, ensuring a comfortable fit for the driver. Door panels are crafted using premium soft-touch materials and feature a Satin Chrome door handle. From the driver’s seat, the three-gauge cluster display includes a tachometer positioned in the middle for performance driving. An available 7-inch touchscreen radio provides drivers with connectivity, information and entertainment. The Classica model features a dual-tip exhaust, Black roll bar finish, and body-color header, side sills and door handles. It comes standard with 16-inch alloy wheels, Nero (Black) premium cloth seats, halogen headlamps and LED tail lamps. Inside, soft-touch materials on the instrument panel are highlighted with light silver accents. The Lusso (“Luxury”) model builds on the Classica, with standard 17-inch alloy wheels, silver-painted A-pillar header and roll-bar cover and dual-tip chrome exhaust. The interior features heated premium leather seats in Nero (Black) or Saddle and a leatherette-wrapped cluster brow. The lower instrument panel is also wrapped in leatherette, with Piano Black accents throughout. 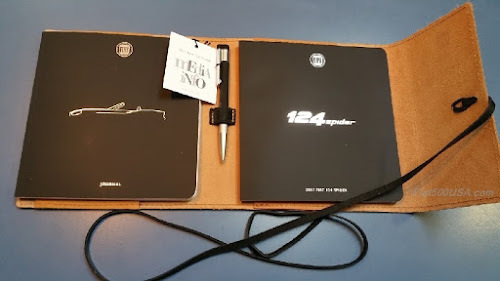 The Lusso model is available in seven colors: Rosso Passione (Red Clear Coat), Bianco Gelato (White Clear Coat), Nero Cinema (Jet Black Metallic), Grigio Argento (Gray Metallic), Grigio Moda (Dark Gray Metallic), Bronzo Magnetico (Bronze Metallic) and Bianco Perla (Crystal White Pearl Tri-coat). 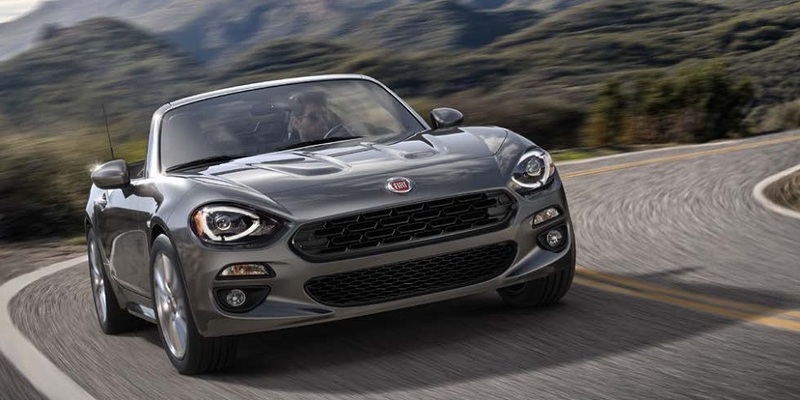 With its responsive handling, excellent power-to-weight ratio, MultiAir Turbo power, use of lightweight materials and precision engineering, the all-new 2017 Fiat 124 Spider delivers the dynamic driving experience synonymous with both the iconic Fiat 124 Spider of yore and today’s FIAT brand. The 2017 Fiat 124 Spider in North America features the proven 1.4-liter MultiAir Turbo four-cylinder engine, the engine’s first application in a rear-wheel-drive vehicle. 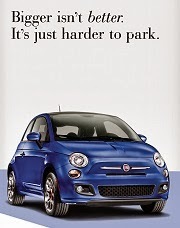 The engine delivers 160 horsepower and 184 lb.-ft. of torque. 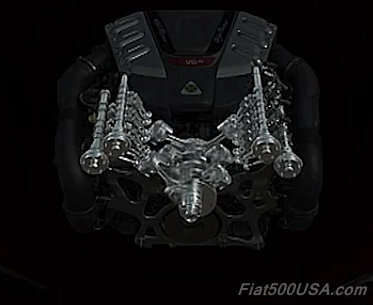 Structurally, the 1.4-liter MultiAir Turbo engine starts with a cast-iron block and an aluminum bedplate. 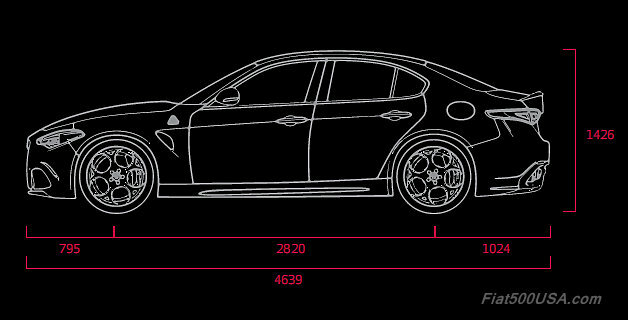 Bore is 72 mm (2.83 inches) and stroke is 84 mm (3.31 inches) for a total displacement of 1,368 cu. cm (83.5 cu. in.). Lightweight cast-aluminum, hard-anodized pistons contribute to the overall strength of the reciprocating assembly and the engine’s high rpm capability. Full-floating piston pins are used for added reliability. Piston cooling jets, located at the bottom of each cylinder, contribute to consistent power delivery and efficient fuel usage by squirting oil on the bottom of the pistons to help maintain piston temperatures and reduce the possibility of hot spots along the cylinder walls or at the top of the piston, which could lead to detonation. 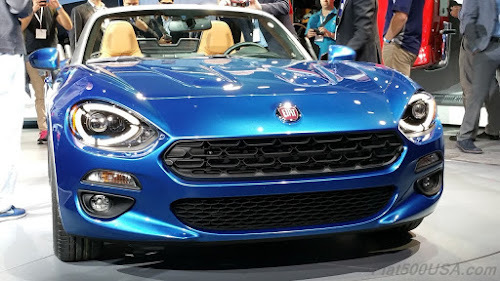 Compression ratio of the Fiat 124 Spider’s 1.4-liter MultiAir Turbo engine is 9.8:1. For optimum fuel economy and performance, fuel with a 91 or higher octane rating is preferred, while regular 87 octane is acceptable. 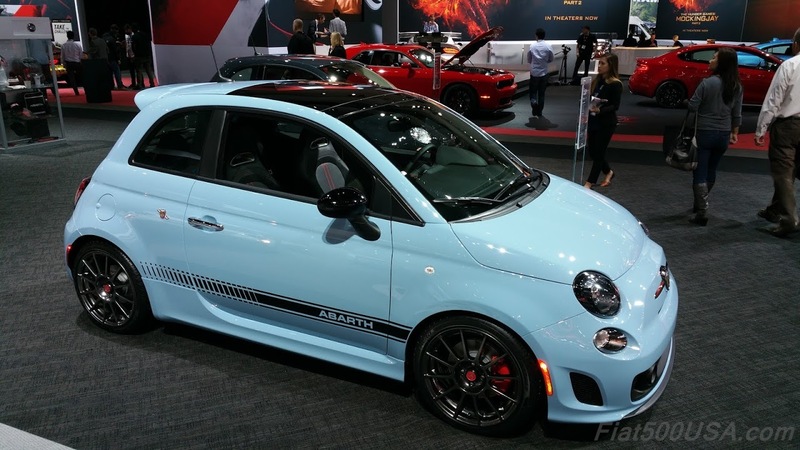 The 1.4-liter MultiAir Turbo engine’s induction system includes a front-mounted intercooler designed to remove heat in the air charge that the turbocharger generates while compressing incoming air (higher air density for more power). Reducing heat provides a cooler, denser air charge that helps increase the potential for more power while reducing detonation sensitivity. 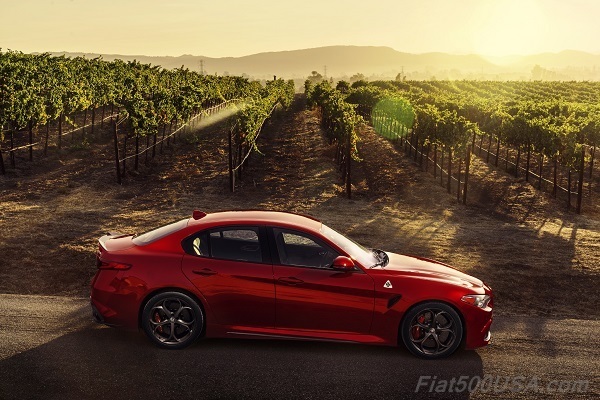 Other high-performance engine components include a new fresh-air intake system, a high-flow air filter and smooth-flowing plumbing for maximum power. Paired with either a six-speed manual transmission (standard on the Classica model) or a six-speed automatic transmission (standard on the Lusso model; available on the Classica), the proven 1.4-liter MultiAir Turbo engine in the Fiat 124 Spider is designed to meet the rigorous demands of performance driving throughout its 6,500 rpm range. The 2017 Fiat 124 Spider’s six-speed automatic transmission uses a lockup torque converter with a damper. Lockup control is available from second gear and up. 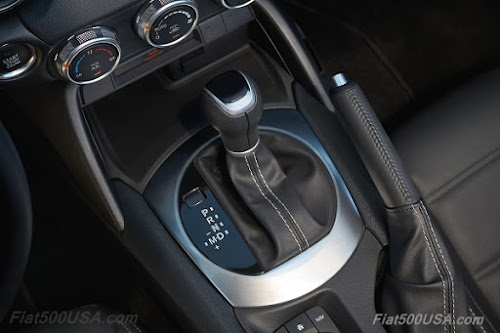 As a result, the six-speed automatic transmission offers a more direct feeling in response to pedal operation and improved fuel economy. The 124 Spider’s six-speed manual transmission is a directly connected six-speed gearbox that features a simple structure and compact, lightweight design. Its die-cast aluminum housing, control over the flow of transmission oil and material use contributes to its lighter weight. Shifts are direct and smooth with only a light amount of force required. The choice of gearing allows the use of a compact rear differential unit to improve fuel economy. To contribute to the 124 Spider’s precise driving dynamics, the clutch pedal operation is optimized, allowing drivers to control acceleration G-forces and delivering easy, quick shifts. The clutch pedal is ergonomically positioned to ensure the optimal length of movement between the pedal at rest and the engagement point – allowing for rhythmical gear changes with a light feeling. Optimized tuning of the pedal based on muscle characteristics results in a clutch feeling that enables precise control over the rate of acceleration. 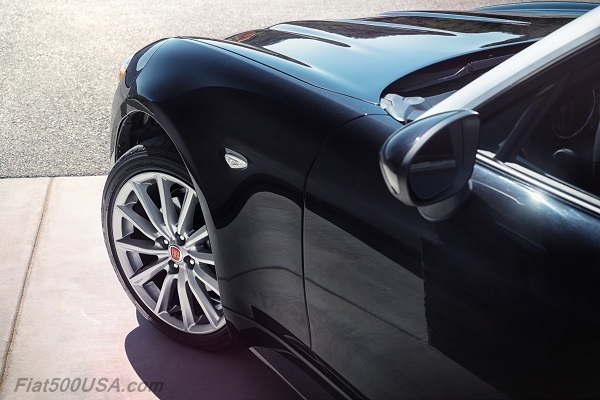 The balanced front-to-rear weight distribution is combined with a lowered yaw inertia moment (achieved by moving the engine rearward and adopting aluminum components at the front and rear ends of the body) and a low center of gravity to deliver a light, dynamic driving experience. The rear differential unit features a ring gear optimized to support the amount of torque produced. The thickness of the aluminum casing is reduced, maintaining strength and noise vibration and harshness (NVH) performance characteristics. The rear differential unit is compact, and the shape of the inside of the unit is optimized to create a smooth flow of oil from the rear differential gears. 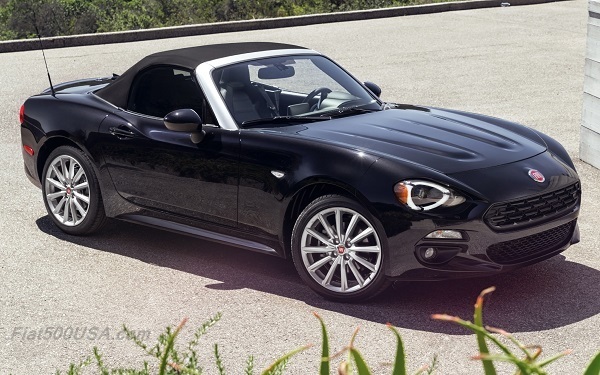 An open-air driving experience is effortless with the Fiat 124 Spider’s easy-to-operate soft top. The operation of the top is optimized by examining the natural path the driver’s hand takes when operating the top and how the driver can most easily apply the force required. An assist spring supports the driver’s action when raising the top from the fully open position, making the force required minimal. 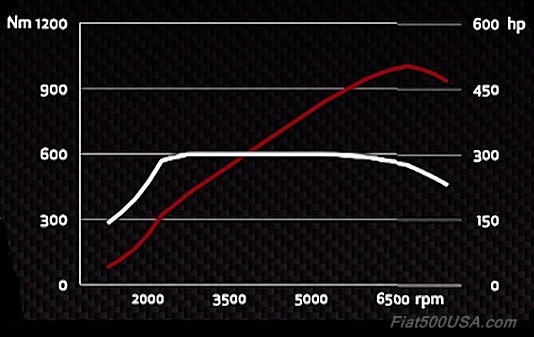 This optimization saves weight by eliminating the need for a power assist system. When the lock levers are used to open or close the top, the windows are automatically lowered to 140 mm lower than their fully raised position, making it easier and more convenient to operate the top. The 124 Spider’s seat structure also makes it simple to operate the soft top while seated. The seat provides a consistent level of support from the thighs, rear, hips and side of the ribcage, while bolsters are less snug at the shoulder level – allowing the driver’s upper body freedom of motion. While driving the 124 Spider with the top and windows down, the human-centric proportions of the body design and the rearward placement of the front header surrounding the windshield help to guide the wind above the heads of occupants and toward the rear of the car – minimizing both the amount of wind striking occupants directly and any drafts wrapping around from behind. The Fiat 124 Spider’s body structure applies the basic concept of using straight beams and creating a continuous framework wherever possible so the various individual sections function in harmony. 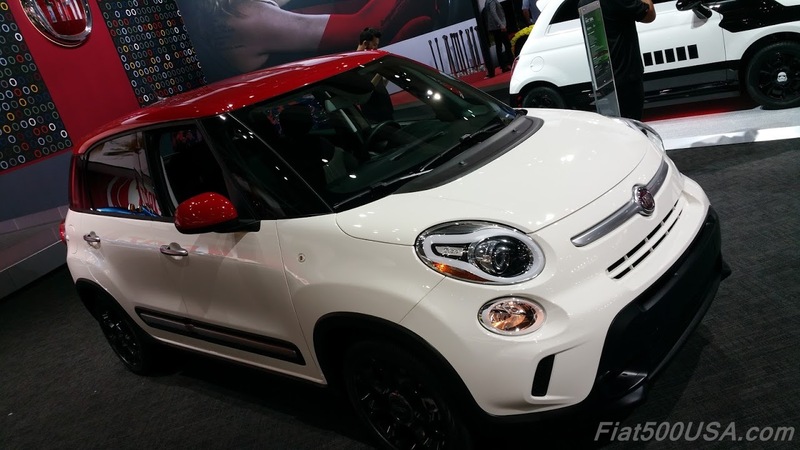 In addition, the use of aluminum and high-tensile steel provides safety and rigidity, producing a lightweight open-top body that responds briskly to a driver’s will. The straight high-mount backbone frame for the front tunnel section – a crucial component for an open-top vehicle – and the large cross section contribute to build a strong structure. In addition, the subframe and crossmembers connect the backbone to the front and rear sections, which help to provide a structure that is lightweight, safe and highly rigid. Driving performance is enhanced by the application of lightweight aluminum parts on the body and chassis. Components made of aluminum include the hood and trunk lid, front and rear bumper reinforcements, seatback bars, underbody crossmember and bulkhead panel. To further optimize weight, the 124 Spider features an advanced seat structure that uses a lightweight net material on the seatback and seat cushion. 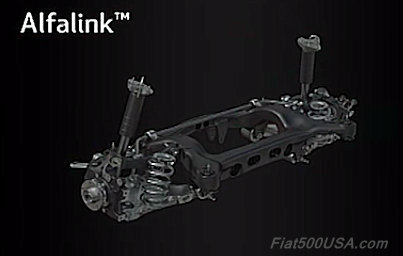 The Fiat 124 Spider’s front suspension uses a double-wishbone layout. The 124 Spider’s multi-link rear suspension helps to improve control while cornering. The dampers are connected directly to the hub supports, delivering a 1:1 damper level ratio in relation to the suspension stroke. The mounting position of the dampers is optimized to minimize changes in the ratio, helping to improve the grip of the tires. The axis of wheel deflection is set behind the point of contact with the road in response to lateral input from the tires. This creates link positioning that uses lateral force from the tires to increase toe-in, even under higher G-forces while cornering, for greater stability while turning. With the use of an electric power assist steering (dual pinion) system, the 124 Spider’s steering is light and responsive, accurately transmitting road input with a minimum of torque variation. Applying the power assist directly to the steering rack delivers positive feedback when steering in the high G-force range. The straight steering shaft position creates a linear steering feel, with the steering gear ratio optimized to deliver a linear response that matches driver tendencies. To minimize noise and vibrations and create a quiet, comfortable ride whether the top is open or closed, engineers adjusted the characteristics between the engine mounts. In addition, the cross-section shape of the frame that joins the transmission to the rear differential is positioned to allow occupants to sit closer to the center of the vehicle, while reducing powertrain vibrations. Individual suspension components are optimized to avoid generating resonance with one another, achieving stability while handling and minimizing road noise. Wind noise is combated with the adoption of an aerodynamically efficient design for the rear edge of the hood, the A-pillars and header. The seatbelt mounting position is located to minimize wind noise while driving with the top down. The 124 Spider also uses materials to prevent fluttering and improve sound insulation in order to reduce noise while driving with the top up. The soft top features a headliner inside the vehicle for improved sound absorption, as well as a rear package mat that adds to sound absorption and insulation. 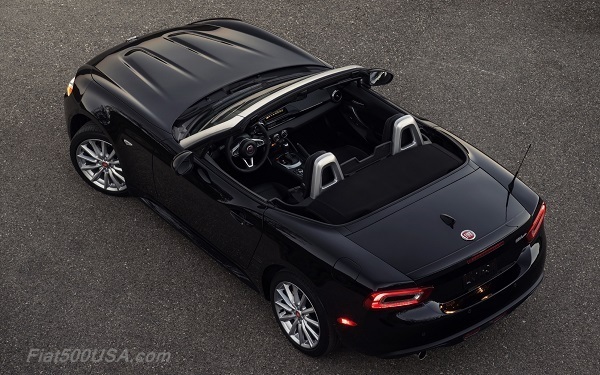 The all-new 2017 Fiat 124 Spider offers an array of safety and security features, underlining the FIAT brand’s commitment to its customers. The all-new roadster is available with features like Blind-spot Monitoring, Rear Cross Path detection and ParkView rear backup camera. The all-new Fiat 124 Spider’s body uses straight beams wherever possible and a continuous framework adapted specifically for a front-engine, rear-wheel-drive convertible. The result is a high-strength, high-rigidity, lightweight structure that helps dissipate energy and improve protection in the event of a crash. In the event of a frontal impact, the structure’s multi-load path disperses energy in two directions. Impact force is absorbed by one path, which employs a cross-shaped structure for crush cans and front frame members, while the other path incorporates an impact-absorbing extension on the front suspension crossmember. This helps reduce cabin deformation. 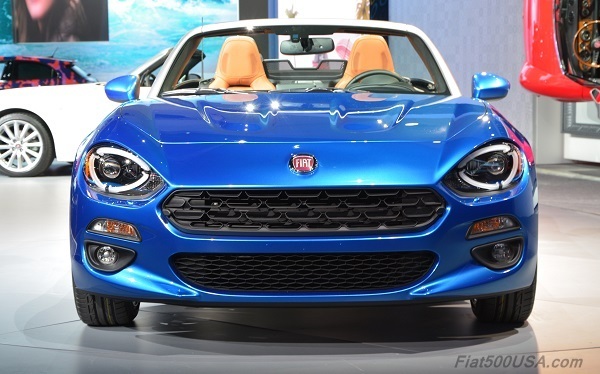 The Fiat 124 Spider’s structure benefits from high-strength, hot-stamped steel and ultra-high-tensile steel around the center of the cabin, along with high-strength aluminum in the front bumper beam. Use of these materials also affords weight reduction. The all-new 2017 Fiat 124 Spider offers a range of technologies, helping to enhance the fun-to-drive nature of the vehicle, and keep drivers connected and safe. 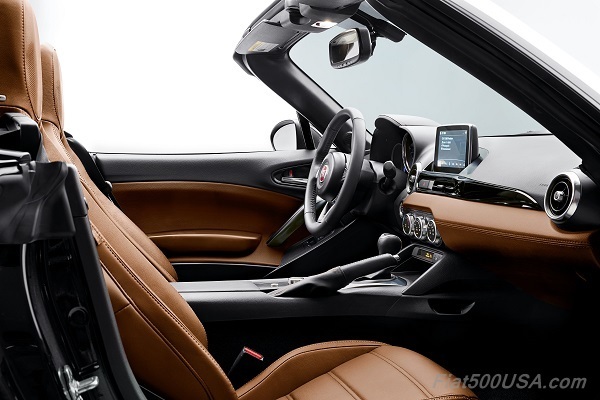 The 124 Spider comes standard with a three-gauge cluster, featuring a large analog tachometer in the center, a speedometer on the right and an information display on the left, allowing drivers to easily monitor vehicle information. In addition to a full array of safety and security features, a collection of technologies provide additional comfort and convenience, including available Keyless Enter ‘n Go, heated front seats, heated side mirrors, auto-dimming rearview and side mirrors and automatic temperature control. 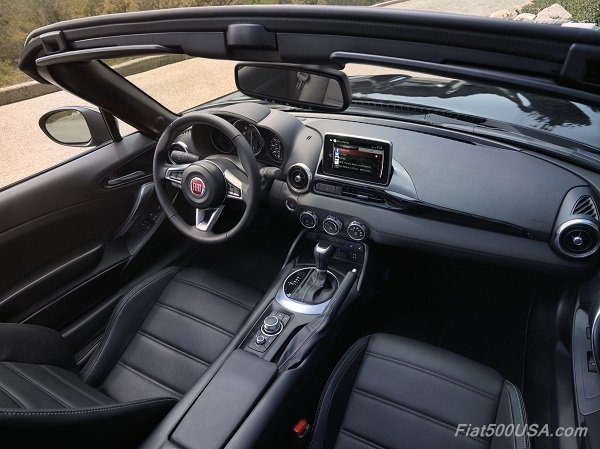 The all-new Fiat 124 Spider features the easy-to-use FIAT Connect systems. The FIAT Radio 3.0, standard on the Classica, includes AM/FM radio, MP3 player, USB port, auxiliary input and six speakers. Bluetooth connectivity with handsfree calling and streaming audio is also standard. 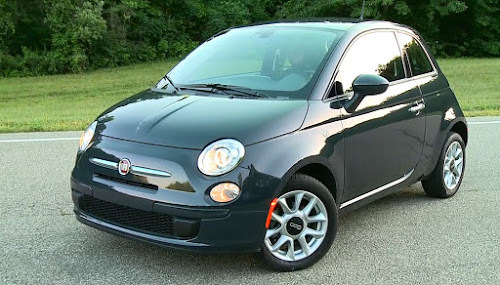 The FIAT Connect 7.0 system, standard on the Lusso and available on the Classica, includes a 7-inch touchscreen display, AM/FM radio, HD Radio, MP3 player, two USB ports, auxiliary input, six speakers, multimedia control, Bluetooth connectivity and ParkView rear backup camera. 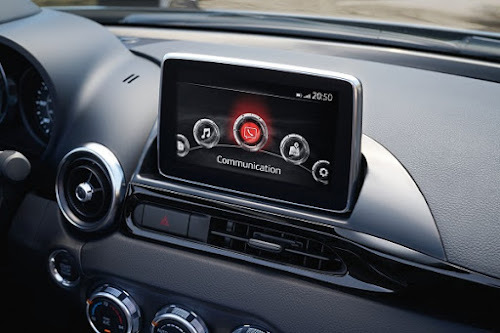 Standard on the FIAT Connect 7.0, voice recognition allows drivers to operate their mobile phone, music and navigation system handsfree, to stay focused on driving. Voice-text reply also allows drivers with a compatible mobile phone to reply to a text message using predefined responses. 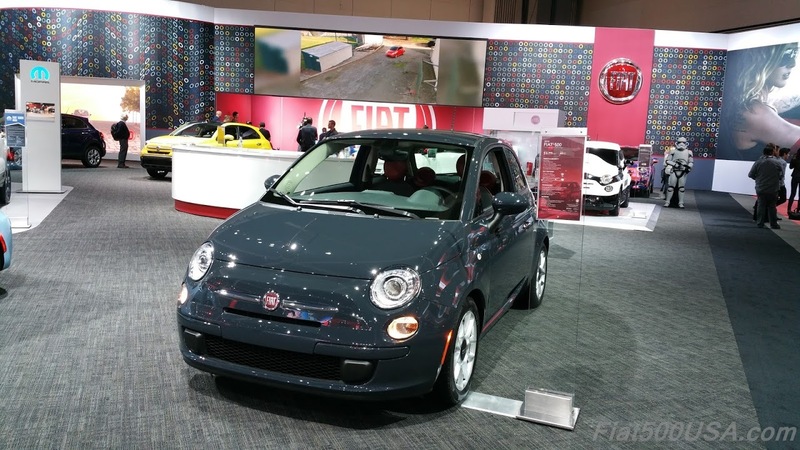 Other available options with the FIAT Connect 7.0 include SiriusXM Radio and navigation. For superior sound quality even with the top down, a Bose premium sound system with nine speakers, including dual headrest speakers per seat and a subwoofer, is available. 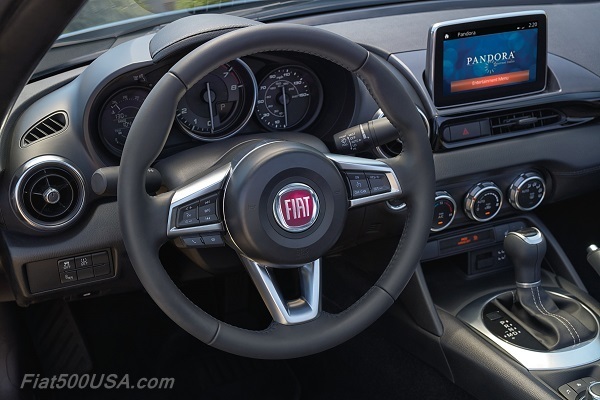 For added entertainment, FIAT Connect 7.0 also provides drivers with access to Pandora, Aha and Stitcher Internet radio apps via Bluetooth connectivity. Aha makes it easy to instantly access more than 30,000 stations of audio content, including leading Internet music services, Internet radio, news, entertainment, audiobooks, Facebook and Twitter newsfeeds, weather and more. Pandora gives people music they love anytime, anywhere. Personalized radio stations launch instantly, with the input of a favorite artist, song, comedian or musical genre. The Music Genome Project, a deeply detailed, hand-built musical taxonomy, powers the personalization of Pandora by using musicological “DNA” and constant listener feedback to craft personalized stations from a growing collection of more than a million tracks. Stitcher Radio is an application that provides access to thousands of radio shows and podcasts streamed directly to devices without downloading or syncing. Discover the best news, entertainment, sports and talk radio, on demand. Recommended content is automatically selected by registering content added to Favorites, or by thumbs-up and thumbs-down rankings. 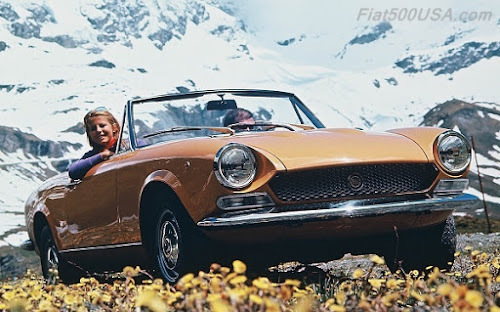 In November 1966 at the Turin Auto Show, the Fiat 124 Spider debuted to great critical acclaim. In the nearly 50 years since its introduction, the 124 Spider has remained an icon for collectors and car buffs alike. 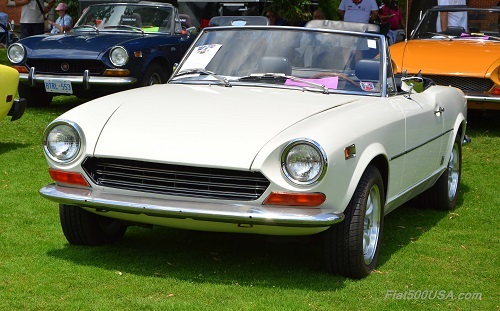 Widely considered the best affordable mass-produced sports car of its generation, the Fiat 124 Spider was first sold in the U.S. market in 1968. The roadster featured a five-speed manual transmission, 1438cc twin-cam engine, four-wheel disc brakes, intermittent windshield wipers and steering-column-mounted lighting controls. 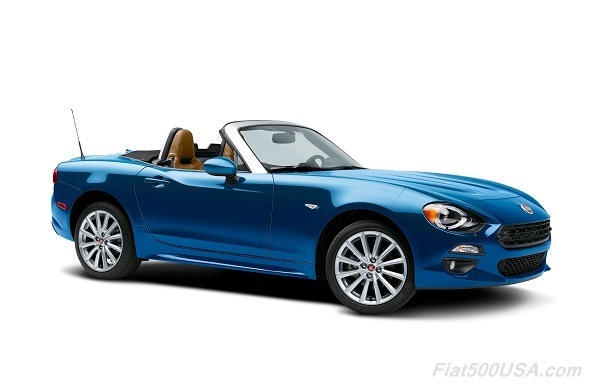 Available in seven colors, the 124 Spider sold with a 12-month or 12,000-mile warranty for $3,265. 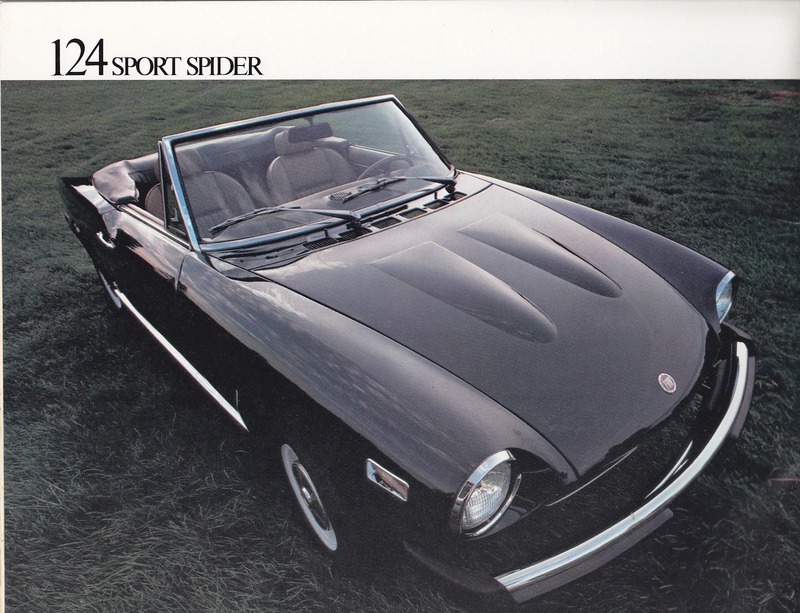 The 124 Spider, which evolved from Fiat’s mid-range 124 sedan, was a true sports car with broad appeal. Fiat chose the design firm Pininfarina, a longtime partner and the largest and most respected name in Italian coachbuilding, to style and build the 124 Spider. Americans loved the Spider’s proportions and unassuming Italian styling. Its water-tight soft top could be lowered quickly and easily from the driver’s seat, and the glass rear-quarter windows provided good visibility. In fact, the 124 Spider’s design was so successful that the vehicle was never extensively redesigned during its 19-year production run, and is still considered one of Pininfarina’s greatest commercial hits. 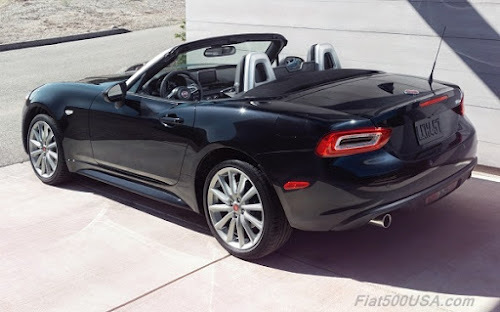 Less than 10 years after its introduction to the U.S. market, the Fiat 124 Spider was such a sales success here that Fiat began producing the vehicle exclusively for the U.S. market in 1975. 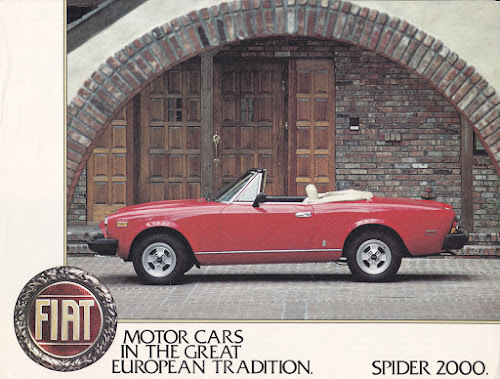 In 1979, the vehicle was renamed the Spider 2000, referring to its new 1995cc engine. Toward the end of 1981, Pininfarina took over the entire production process of the vehicle, and sales in Europe resumed. In 1982, production of Fiat and Pininfarina Spiders overlapped as Fiat built the last Spider 2000 models and Pininfarina began production of its own version, sold in the U.S. as the Pininfarina Spider Azzurra and in Europe as the Pininfarina Spidereuropa. The Pininfarina Spider Azzurra included leather trim, stereo/cassette player and power windows as standard. Production of the roadster ended in 1985 after nearly 200,000 Spiders had been built. Its extensive 19-year production run means the Fiat 124 Spider outlived nearly all of its contemporary sports car competition, excluding the Alfa Romeo Spider. More than 170,000 124 Spiders were sold in the U.S. from 1968 to 1985. Today, there are nearly 8,000 still registered here. 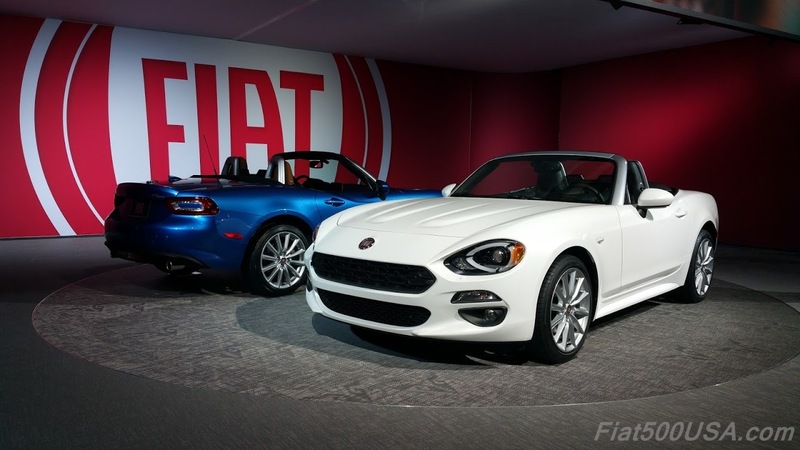 With its global debut at the 2015 Los Angeles Auto Show, the 2017 Fiat 124 Spider revives the storied nameplate, bringing its iconic Italian styling and performance to a new generation. The Mopar brand is spinning a comprehensive “web” of products to assist owners in customizing the all-new Fiat 124 Spider. From premium leather seat options, to graphics packages, to functional performance items, the Mopar brand makes sure that every customer has the option to personalize and make the Italian-inspired roadster truly unique. Mopar parts are engineered together with the same teams that create factory-authorized specifications for FCA vehicles. This offers a direct connection that no other aftermarket parts company can provide. 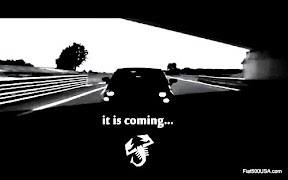 A complete list of Mopar accessories and performance parts is available at http://www.mopar.com.